Glass is free cut in sizes from 1/2" to 1" or in larger pieces. Fruit Salad #2 Stained Glass Bullseye Fusing Glass..Shards of Purple Cranberry coe 90 NEW! Bullseye Fusing Glass..Shards of Cranberry Pink coe 90 NEW! An assortment of our premium quality red stained glass colors, larger pieces, not chips. Glass is free cut in various shapes and sizes from 1" to 3". 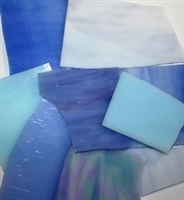 An assortment of our premium quality aqua (plus teal and turquoises) stained glass colors, larger pieces, not chips. Glass is free cut in various shapes and sizes from 1" to 3". An assortment of our premium quality purple stained glass colors, larger pieces, not chips. Glass is free cut in various shapes and sizes from 1" to 3". An assortment of our premium quality orange stained glass colors, larger pieces, not chips. 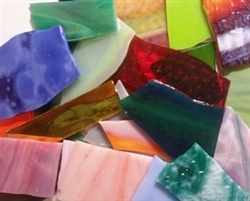 Glass is free cut in various shapes and sizes from 1" to 3". An assortment of our premium quality white/off-white stained glass colors, larger pieces, not chips. Glass is free cut in various shapes and sizes from 1" to 3". Assorted Brown Stained Glass Assorted Stained Glass Stained Glass - Purple-Mauve NEW! Caramel Stained Glass Youghiogheny #1 Glass..NEW! Youghiogheny #2 Glass..NEW! Warm beautiful shades of honey in this slightly translucent glass. Wispy Yellow Stained Glass Transparent Yellow Stained Glass Stained Glass - Marigold - NEW! Transparent yellow stained glass, large cut pieces. New from Youghiogheny - shades of green. New from Youghiogheny - shades of browns/greens/golds. Textured on one side, smooth on the other. New from Youghiogheny - soft lime-blue-green colors. Almost out! Spectrum teal green translucent glass with iridescent metallic coating. An opaque fern green stained glass with streaks of lighter shades of green and greenish-white. Spectrum Glass. Swirls of pink shades, opaque. Shiny bright ruby red translucent stained glass with slight texture. A bright solid color red stained glass, slightly textured. Unusual and dramatic shiny deep blue stained glass with a little bit of occasional pink, slight texture. 2 packs left ~ Spectrum translucent iridescent dark cobalt blue stained glass. Spectrum Glass opaque cobalt blue with no streaks stained glass.